Tuesday was Nora’s first day of kindergarten. She is gone from us five full days per week from 8:30-3, learning in a wonderful Montessori school that just opened here in town. Since her birthday is in September, there was some discussion about waiting another year before starting school (two of her friends that are older than her by a few weeks are not going to kindergarten this year), but since we’re going the Montessori route which will allow her to move at her own pace we decided last spring to make the kindergarten leap this fall. I am so glad we did, because she is obviously so ready. Besides being the clever little person she is (I still cannot believe how much she can read), Nora was also emotionally ready to spread her wings and spend more time out of the nest exploring the world on her own. She counted down the days until her first day of school and pretty much wanted to run out the door at 7 AM Tuesday morning. Not a tear was shed at drop-off and she has been happy as a lark both days at pick up. Zara and I are enjoying some one-on-one time, and I’m looking forward to the increased work time as I continue to grow Au Coeur Design. 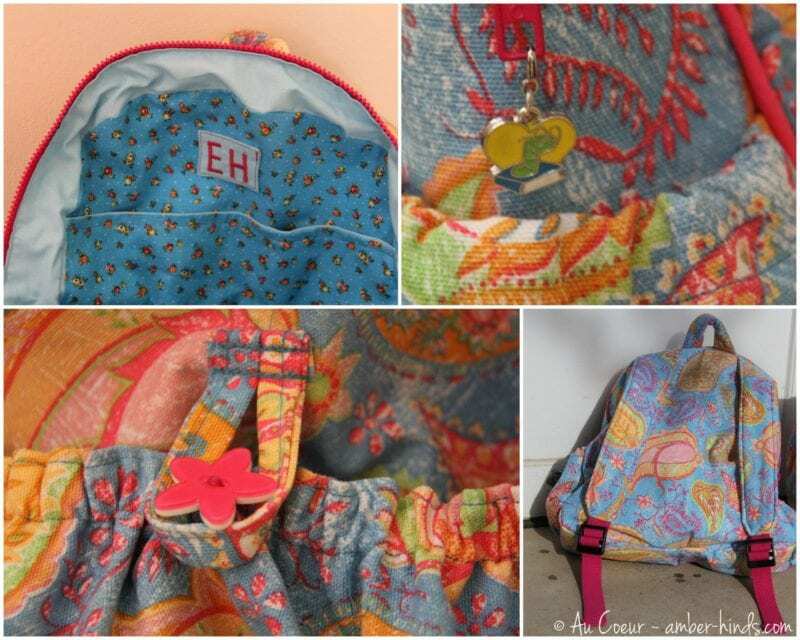 Last Thursday, almost at the last possible moment, I decided that it would be fun to take on a special back-to-school sewing project: rather than buying Nora a backpack and all her required paraphernalia, I made it instead. 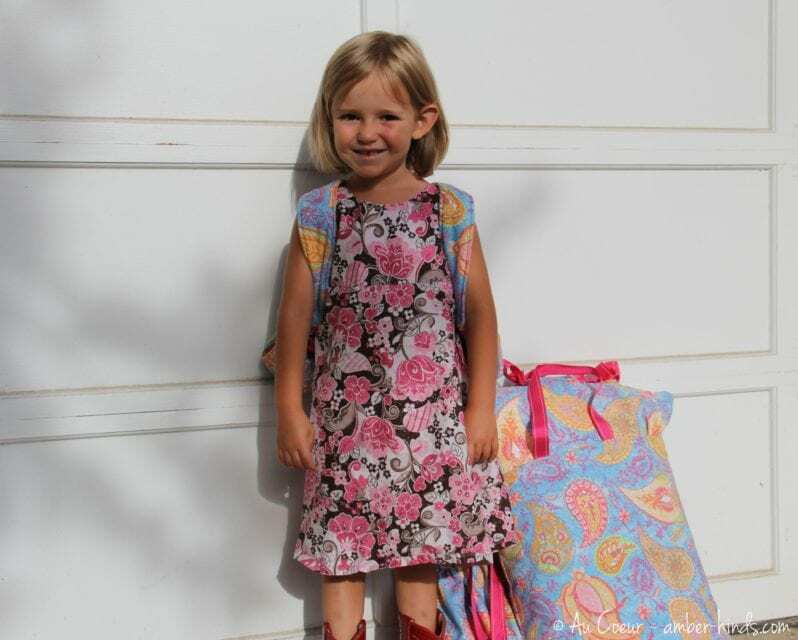 Nora found this fabric inmy stash awhile ago and had asked that I make her something with it, so I used it to sew a backpack, a drawstring bag for her extra clothes that have to be left at school, a bag for her nap time sheet and blanket, and a matching pillowcase. I could not be happier with how everything turned out, especially her backpack. This is the first time that I have ever sewed with interfacing, piping, or zippers, and also the first time I have sewed since last Halloween, so I was a little nervous about how it might turn out. You may have seen on my instagram that I started out by measuring an existing backpack and sketching out all of the pieces. I don’t normally sew with patterns, partially because I’m cheap and partially because I don’t mind muddling through a bit. In this case, though, I sketched it all out, cut one panel and then decided that a smart person would use a pattern for something as complex as a fully lined backpack. After a bit of research, I settled on this pattern which I could purchase online and download instantly for $10. I maintained the overall feeling of the pattern, keeping the shape and pocket set up, but I also modified the pattern quite a bit. The backpack I made is about 1/3 bigger than the one in the pattern; also, I made my straps adjustable and padded both the back of the backpack and the straps. 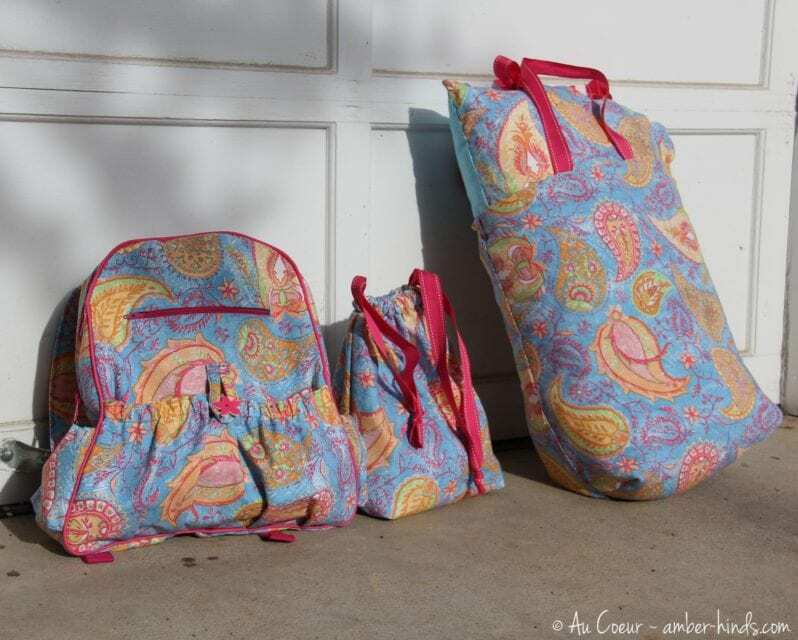 Since I made Nora’s backpack bigger, I didn’t use a lot of the pattern pieces when cutting, but I am so glad that I had the directions to follow and that I didn’t have to decide when to do what. The final product is so much better than I imagined, and Nora was thrilled to have it. 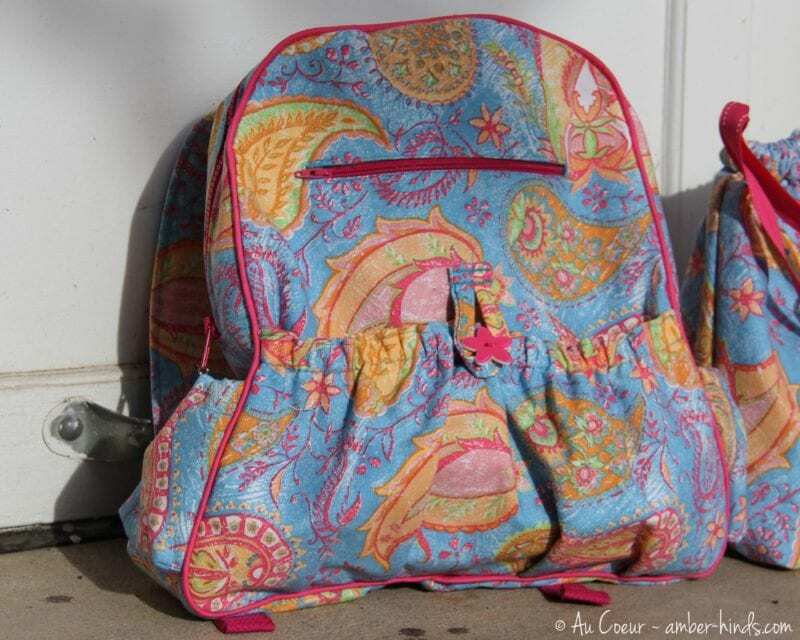 It has lots of pockets and plenty of room so as long as my stitches hold up, this should last her through the end of elementary school, at least. It also was pretty cheap; I already had the fabric, interfacing, batting, and buckles, so I only had to buy zippers, piping, and thread. I did not have time to get to it over the weekend, but I’m planning on sewing her a matching lunchbox, too. By the way, notice the initials? Apparently Nora decided that she would rather go by her full name at school, and so her teachers are all calling her Eleanor at her request. It’s been a little bit of a challenge to remember that when I speak to her teachers, but I’m working on it.